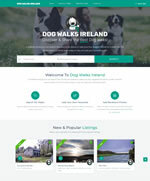 Dog Walks Ireland is a website where you can search the country for places to take your four legged friends for a walk. Use the search feature to find a walk near you today or why not add your favourite walk! !